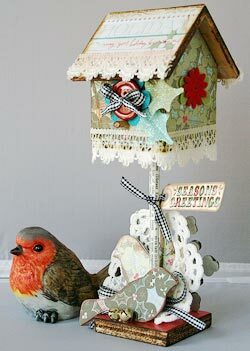 I found this cute little wooden birdhouse at the thrift store and knew I had to alter it. I covered every surface with wonderful Christmas patterned paper and embellished it with glitter leaves and rub-ons from Heidi Grace; Ranger ink to ink the edges; Felt flowers from American Crafts, Chipboard from Maya Road and Bazzill; Ribbon from Offray; A Paperabilities tag; buttons, trimmed the bottom with lace, bells, and dictionary pages. TFL! I am giving it as a gift to my Mother in Law. We actually have a family gathering about 2 weeks before Christmas, so she will have time to display it for the holidays. She always loves my handmade gifts. 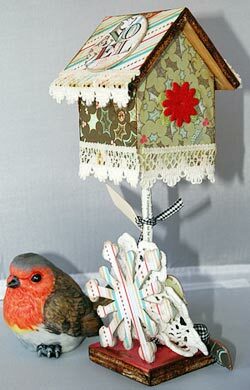 I also have altered some birdhouses that I have displayed in my home.